The signs are all there. Those that still support this piece of slime are frighteningly similar to the supporters of Adolf Hitler, especially in the run-up to World War II. 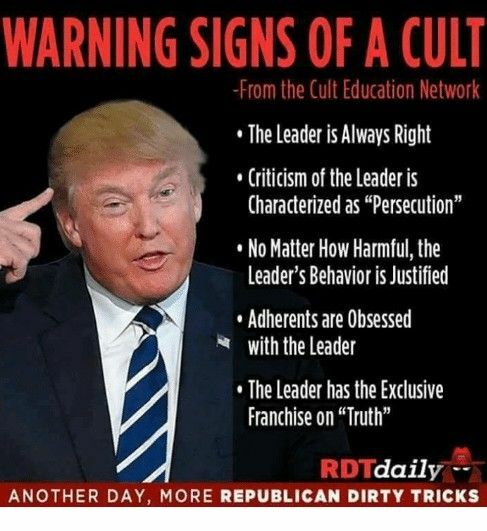 The complete and willful ignorance and denial of the truth turns such followers into mindless robots willing to go to any lengths to support their leader. This is Trump’s base. This entry was posted in Facts & Statistics, News & Views and tagged Adolf Hitler, always right, base, criticism, cult, Cult Education Network, denial, dirty tricks, ignorance, justification, mindless, obcession, persecution, robots, Trump, Trump's Base, truth, warning signs, witch hunt on November 16, 2018 by Ray Buchanan.